Window Treatment Sheer voile curtains give a light, romantic and airy look to a room by allowing sunlight to pass through the curtains. The fabric of voile curtains make for a unique window treatment that allows you to see outside but still allowing for privacy. For most home owners this is a great feature of sheer voile curtains. Light weight sheer voile curtains are a very effective decorating tool. Because of the lightness to the fabric allow light to enter the room while still providing privacy. They can be used for in many other ways as well. 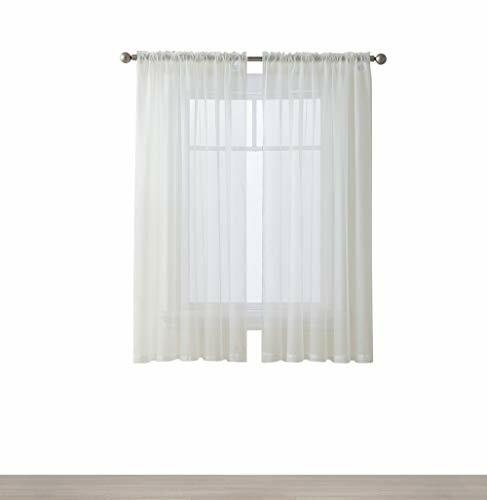 One of the great qualities to sheer voile curtains is they they come in a wide variety of colors and are generally inexpensive. This allows your to use them in every room of the house without breaking your budget. Sheer curtains are very easy to install and make them a great addition to any room as you can create a designer look with little effort. Whats included: Package contains two (2) Sheer Voile Panels, each measures 54" inch Wide x 45" inch Long. Can fit any curtain rod pocket up to 2" inch. Filters light to flow through your windows to feel the open air and sun especially early in the morning. Sheer Voile Draperies can be mixed and matched with any curtains. They are the perfectly simple accent you can add to your windows. Very soft and lightweight fabric for any room you would like a breeze flowing in. Can also be used for Kitchen windows to add a tier to your small window. If you have any questions about this product by HLC.ME, contact us by completing and submitting the form below. If you are looking for a specif part number, please include it with your message.